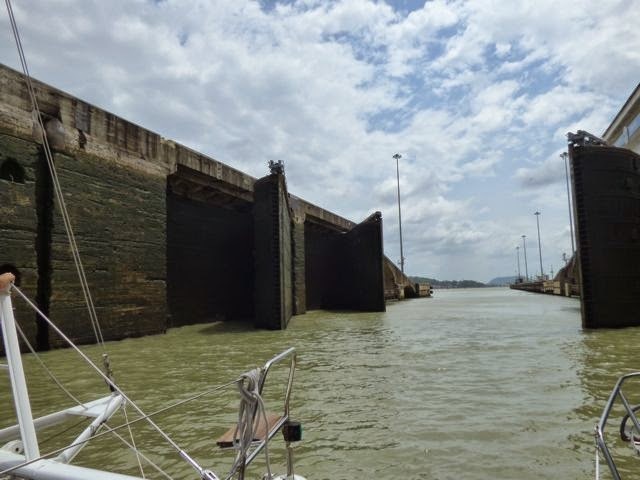 Galley Wench Tales: Panama Canal Transit: Survived! we began our Panama Canal transit. 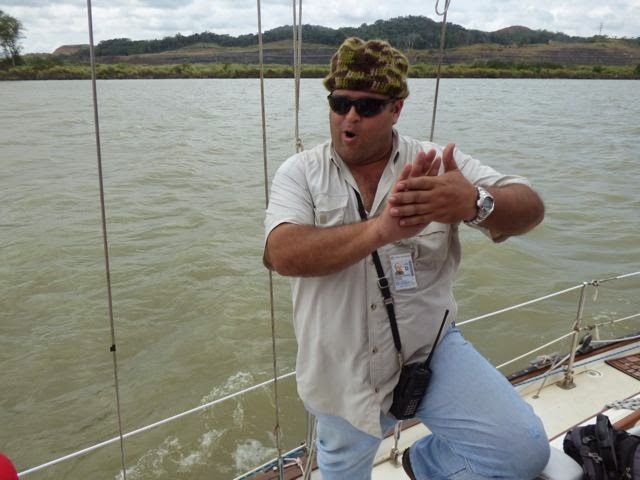 We were ready with bells on our toes at 1500 hours (3 pm EST), Friday February 13th, our scheduled Panama Canal transit. Ok, maybe not bells on our toes, but we were at F flats anchorage at the designated time, with crew, lines, and tires as required (click here for more on our crew and prep). However, our canal transit time kept getting bumped. We waited, anchored, motored and re-anchored as requested. Finally, the car carrier they delayed us for, motored through F Flats, and we followed, along with the other two sailboats we would "raft"* to through the locks. back to the canal crew. Eventually, despite 20+ mile an hour winds and darkness, we worked our way through the first set of Atlantic/Caribbean Gatun Locks towards the Pacific Ocean. *Rafting is when boats are roped together. In this case, the was a catamaran, "Bonobo", in the middle, another monohull sailboat, "Sea Wolf" on one side of the catamaran, and we were on the other. There was a car carrier freight in front of us, and our trio brought up the final boats, all linked across together, passing through the canal that night. 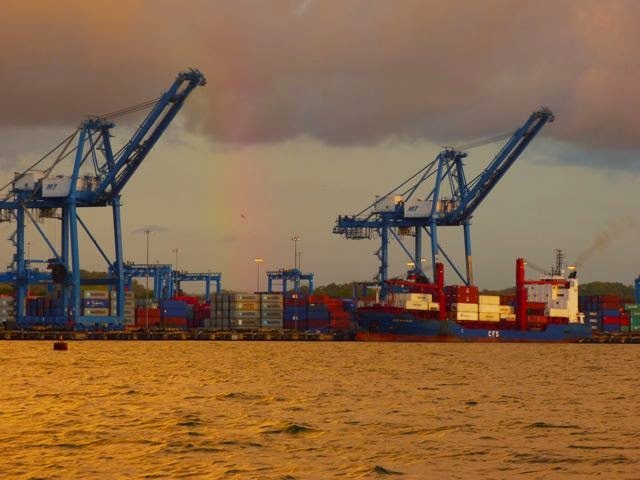 That night, we went through Gatun's three sets of locks, which together moved us nearly 100 feet above the Atlantic water level. Each lock acted as an "up" water elevator. 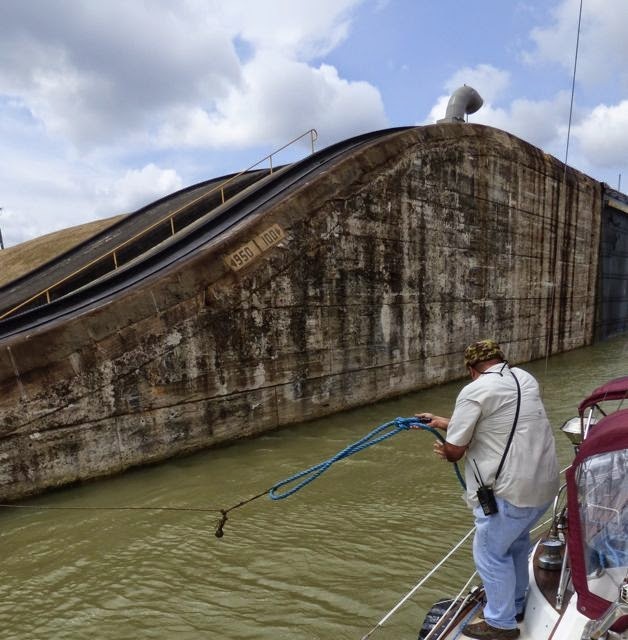 Our job was to keep the boat from hitting the steep cement side of the canal, while they flowed in the water between each sealed gate (lock) and we progressed through it to move us up to the level of Lake Gatun. (the metal piece to the left of the parallel wood slats) snapped. Most of it went smoothly. 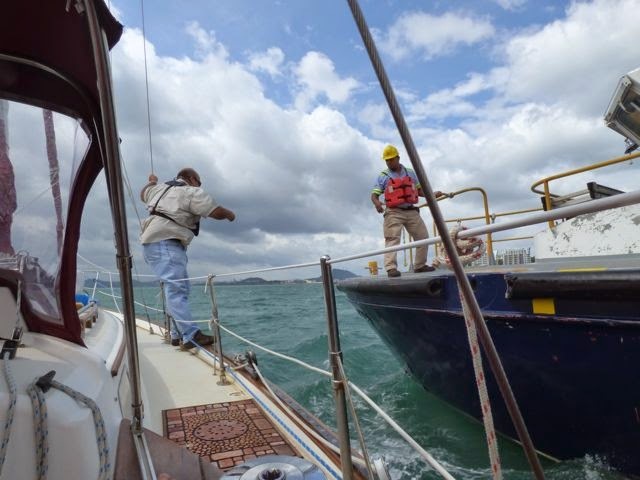 The process involved catching a thin rope thrown by Panama Canal crew from the upper side wall of the canal to us, with a small fist-sized weight called a monkey's fist to catch the end of the line, tie it on to some thick lines on our boat, and alternately tighten and loosen our line from our boat's bow and stern to keep us tracking cleanly though the canal locks. A "BANG" sound Wayne described as sounding like a canon shot ricocheted across our boat. It was the awful sound of our port (left side) chock snapping in two, with the latter half disappearing into the lock, gone to us forever. The chock held the line connecting our boat to the catamaran rafted to our right. 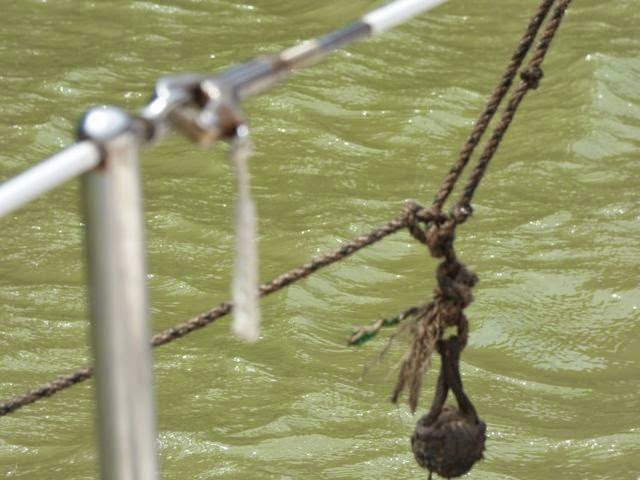 As the water roiled from the hydraulics of a gate opening, and the car carrier's propellers churning the water that much more, I gasped in fear of the adjoining rope pressure's shift from the "sturdy" chick to our far less robust stanchions. Fortunately, the hydraulics calmed quickly, and our stanchion took very little stress before we scrambled to come up with an alternate solution. 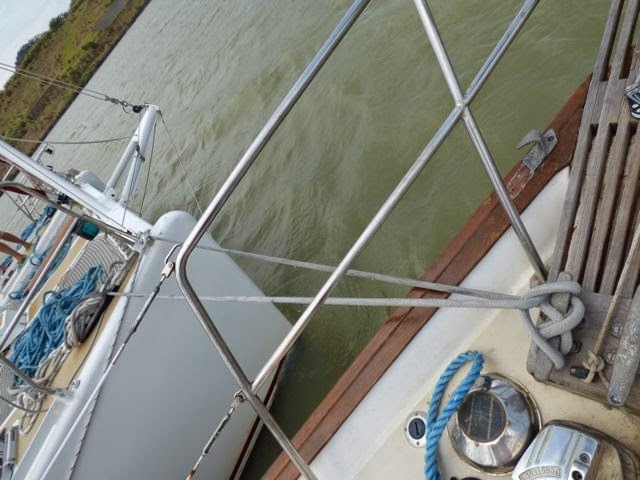 We retied our bows from cleat to cleat, bypassing both the chock and the stanchions. It worked. the boat on the left side of our three boat raft. While the distance we traveled was only a few miles, we did not finish our run through Panama Canal's Gatun Locks until around 10 pm. We tied off to the same sailboats we rafted through the locks, untied, and re-rafted to share a mooring ball at Gatun Lake at about 10:30 pm. At 11:30 pm it was lights out. At 6:25 am the next morning, Jose, our next canal advisor clambered aboard and by 6:30 am we were off to complete the remaining set of locks. That involved dropping back down the near 100 feet we gained, to return to the level of the Pacific ocean. Canal lock gates closing behind us. Our ~50 mile trip out was relatively uneventful; a good thing. 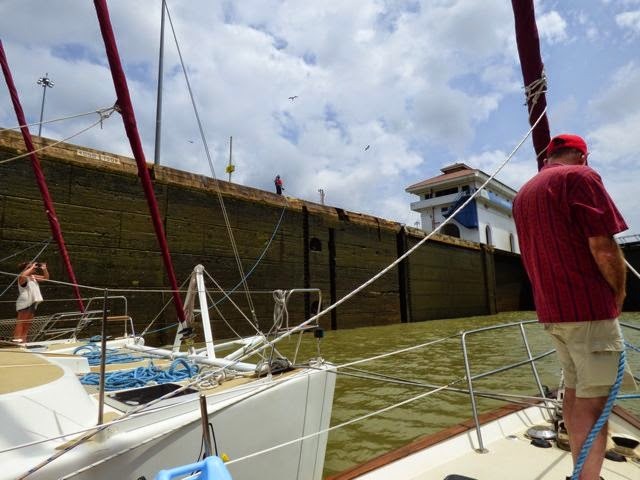 It's far easier to release line when you're dropping back down the locks to the ocean than it is to keep your boat stable while getting elevated up to a higher level, as we were the prior day when our chock exploded. 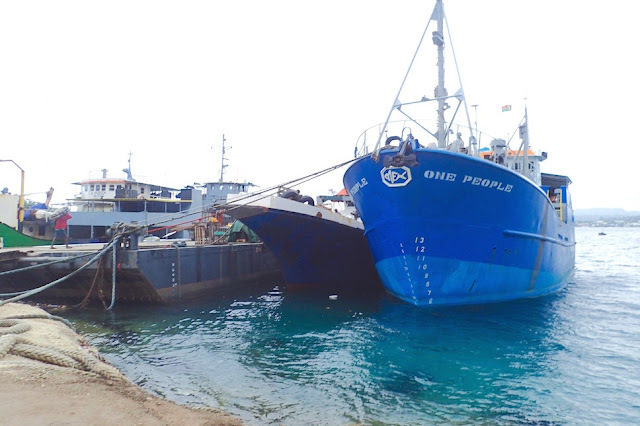 We successfully transited the final locks and dropped our hook in Pacific Ocean about 2:30 pm Valentine's Day. Canal lock gated opening to let us through. We did not eat our Havana Hash on passage (click here for that GWT original recipe), though we did enjoy a good late lunch of Asian chicken noodle soup, coffee and pancakes in the morning and a lunch salad of beets, oranges, hearts of palm and kalamata olives in a viniagrette of pumpkin and olive oil and balsamic vinegar with a dusting of black pepper. 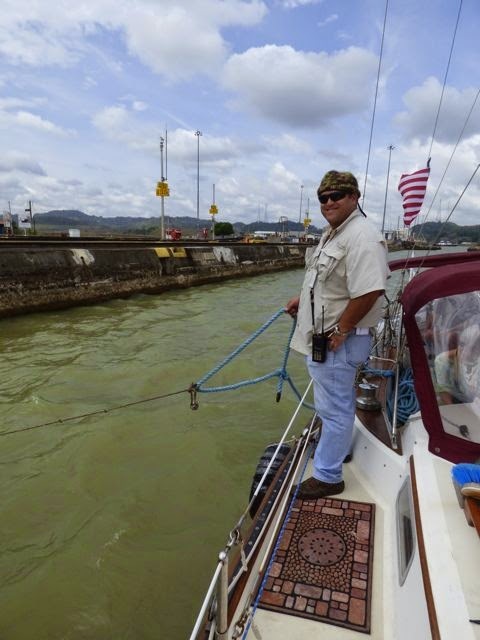 Jose avidly describes the changes the new canal locks will bring. Our friends Ron and Tricia left to return to their rooms in Panama City where they would not find themselves sharing a place to sleep on a boat that sleeps two well, four moderately and six, especially when in rains (and it did) terribly. That and they had Valentine's dinner plans. 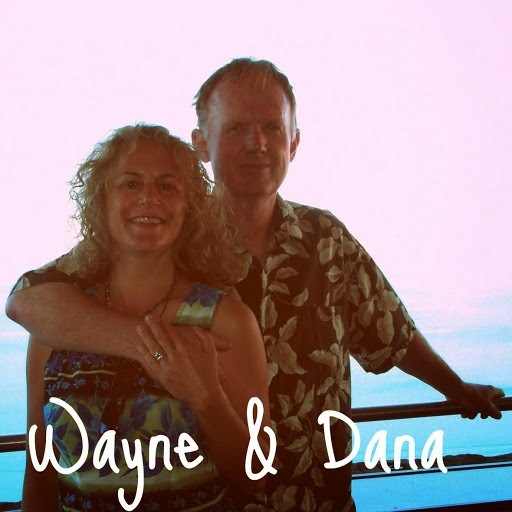 We were grateful for their excellent company and assistance, along with Wayne's Dad and his lovely wife Gunnel, still aboard with us anchored in the Pacific off Panama City, PANAMA. Ron was snapping lots of photos our first night through the canal; hopefully some will make their way into a future blog. As for us... it's not every day you get to spend Valentine's Day crossing from one ocean to another in less than a day. Pearson 365 sailboat to his pilot boat home in 20 knot winds. We're in the La Playita anchorage alongside Panama City (N08.54.519 W79.31.497). We'll be here at least a week doing boat maintenance and repair, topping off our provisions for the South Pacific and enjoying Panama City. We may even be able to catch part of the Carnivale here before we take Wayne's Dad Phil and Gunnel with us to Las Perlas before we head off to Galapagos and we head home. I write this blog rocking back and forth in our rolly anchorage. "Calm anchorages will be a thing of the past," Wayne let me know. Ah well; it's a fair price to pay for the adventure of a lifetime. 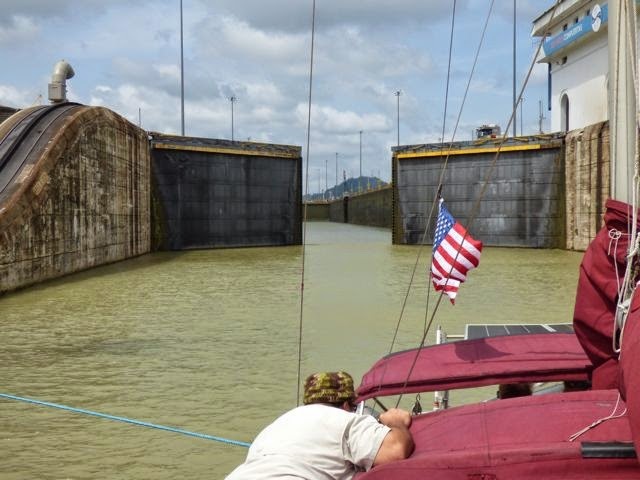 Congratulations for conquering the Panama canal! Now get some rest and then we want to see some more photos. Thanks Lili! Did just that (and a lot of what Wayne calls "guerilla shopping" .... More photos coming up;).